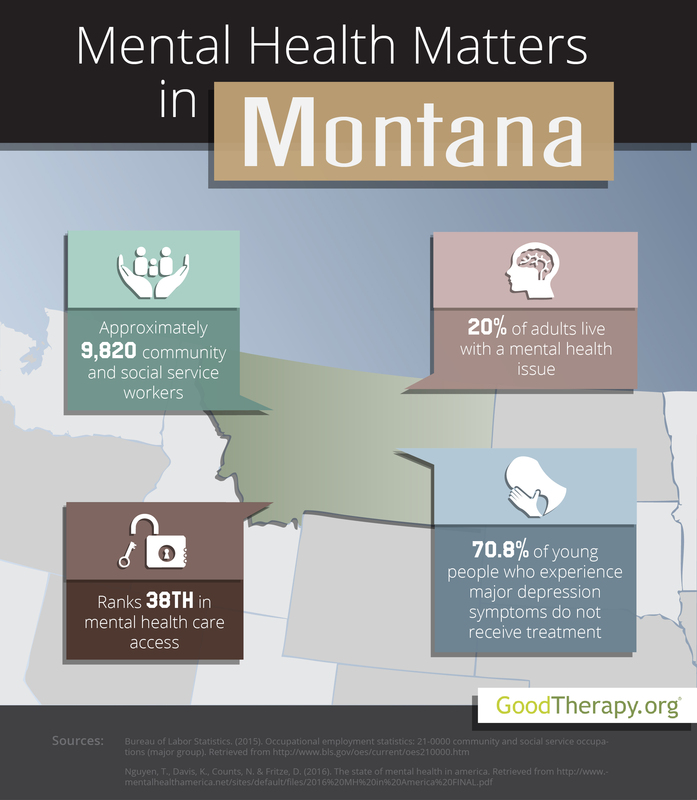 Find a therapist in Montana with GoodTherapy.org. Information from the United States Census Bureau suggests just over a million individuals resided in Montana in 2015. This population consisted of 89.4% white residents, 0.6% black residents, 0.8% Asian residents, and 6.6% American Indian and Native Alaskan residents. Approximately 49.8% of the population in 2015 was female. People age 65 or older accounted for 16.7% of the population, while 22% of all residents were under the age of 18. Data from the Bureau of Labor Statistics (BLS) states 9,820 residents were employed in community welfare and social service occupations in 2015. These occupations included working as psychiatrists, child psychologists, counselors in rehabilitation centers, school guidance counselors, therapists at depression treatment centers, community health workers, and marriage and family therapists. In Montana, people who worked in these fields earned an average of $37,170 each year. Mental Health America’s (MHA) 2016 survey—which explored mental health standards across all states in the U.S., including the District of Columbia—gave the state of Montana a rank of 34th for overall mental health. Montana was also 35th in adult ranking, 48th in youth ranking, 38th in prevalence of mental health issues, and 38th in access to professional mental health care. These rankings are in the lower half of all rankings, which is an indicator of high rates of mental health issues and low rates of access to treatment. Many therapists in Montana agree with Mental Health America’s report that adverse emotional, behavioral, and psychological conditions present a significant concern for adult residents. According to the survey, approximately 153,000 residents in the state are affected by at least one mental health issue. Montana was ranked 37th for adults with serious thoughts of suicide—with 32,000 people affected—and 49th for adults with dependence on alcohol or drugs—with 81,000 people affected. The Substance Abuse and Mental Health Services Administration (SAMHSA) states that from 2009-2013, Montana’s percentage of heavy alcohol consumption among residents age 21 or older was 8.3%--more than the national average of 6.8%. About 24.4% of adult residents with mental health concerns—or roughly 37,000 people—have no insurance, giving Montana a low ranking of 45th in this category. There are also distinct behavioral and mental health concerns for young people in Montana. Therapists from SAMHSA claim that in 2012-2013, cigarette use and binge drinking among teens in Montana were higher than the respective national percentages. The 2016 MHA survey gave the state a ranking of 50th for young people with alcohol or drug addictions—with 6.8% of teens affected. Despite these findings, Montana appears to have a lower prevalence of major depression symptoms among adolescents than most other states. The MHA survey listed Montana in 12th position for young people with at least one major depressive episode in the past year, and 5th for young people with severe symptoms of major depression. According to MHA researchers, this 5th place ranking correlates with high rates of high school graduation for students with disabilities, low rates of unemployment, and low rates of obesity in the state. At 16%, Montana was ranked 49th for children with private insurance that does not provide coverage for mental or emotional issues.